For the past few months I have been brewing pale ales with a range of different yeasts and as a follower of The Mad Fermentationist blog I thought it was about time I tried Wyeast 1318. The author of the blog Michael Tonsmeire has been brewing several beers with Wyeast 1318 one of which is called Hop Juice – Northeast IPA which from his description sounded like the perfect IPA. Not wanting to simply copy the recipe on the blog I took an old pale ale recipe I have brewed many times and swapped the yeast to 1318 and changed the dryhopping schedule so that I dryhopped it while the fermentation was still very active. The Pale ale had an OG of 1.046 and was dry hopped with a generous amount of Citra and Amarillo. This was a 50L batch and used a mash efficiency of 85%. The grist and hopping schedule is below. The mash was at 64degC for 60min and the boil was for 90min. The wort was then pumped to the Whirlpool for a 30min rest before being knocked out to the fermenter. The wort was oxygenated at 1L per min for 2min. Yeast was pitched at 17degC and allowed to rise to 19degC, on day 4 the dryhops were added and the temp increased to 20degC for a further 4days. At this point the fermenter was crashed to 2degC and the yeast/hops dropped out of the bottom dump valve on the conical. The final gravity being 1.011. Following 7days at 2degC the beer was transferred to 2 x corny kegs and force carbonated. One interesting thing is that normally after 7 days at 2degC I would expect the beer to be fairly clear but not this time it still had a very distinctive haze! Comment from The Mad Fermentationists blog seem to be correct, dryhopping during the active fermentation phase with this yeast really do have a drastic effect on beer clarity. 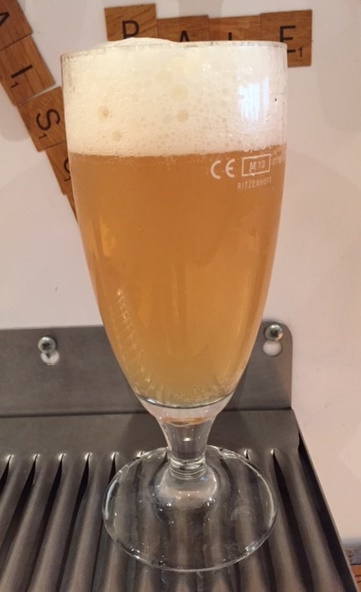 The picture below shows the hazy beer, this photo was taken about a week after the beer had been kegged and placed in the kegerator at 5degC. This really is one of the most refreshing pale ales I have brewed, it comes in at about 4.7% but drinks so easily its unbelievable, it is a true session pale ale, the aroma has a big citrus hit with everything you would expect from a big whirlpool and dry hop addition of Citra, but the Amarillo just restrains it nicely, it kind of takes the sharp corners off the Citra which can sometimes be unpleasant in Citra only beers. And the bit I was not ready for was the depth of flavour when you take a mouthful; it really is like tropical/citrus fruit juice on the tongue! The one thing I think it does need is a little more mouth feel, I think an addition of something like 5% Carapils and may be 2-3% of Caramalt would take care of this, as too would mashing a little warmer say 66degC – but I think I would sooner mash at 64degC to keep the ferment ability and just add a small percentage of speciality malts to and the malt complexity to the beer. I’m that impressed with this beer that the yeast will soon be getting another outing, this time an all Simcoe IPA which will come in at about 6%.